Alive in the Spirit, Living for Christ! New Things & Events added regularly! See inset in side panel to download brochure. See inset in side panel to download brochure! Keynote Speaker for Day of Renewal Announced! Fr. 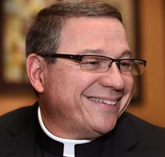 Paul Chaim Benedicta Schenck is a Pastoral Provision priest currently serving as Parochial Vicar in St Elizabeth Ann Seton parish in Mechanicsburg and Director of Deacon formation for the Diocese of Harrisburg. Raised Jewish, Father attended Hebrew school in Niagara Falls, NY. A public-school graduate, he completed studies at the Institute of Jewish Studies in the State University of New York and the Baltimore Hebrew University. He holds degrees in scripture, theology, bioethics, psychology and education. After reading the Gospel of Matthew and other Christian literature and impressed by the Charismatic Renewal, he asked for baptism from a Charismatic Salvation Army Lieutenant who was acting pastor in a Methodist/Brethren chapel. He enrolled in a Pentecostal bible college and an Evangelical seminary and was ordained in the evangelical Anglican tradition. He was a short-order cook, kennel cleaner, janitor, youth minister, pastor, rector, Teen Challenge director, and seminary professor before he and his family entered into full communion with the Catholic Church. Father is married to his high school sweetheart Rebecca. They have eight living children, four are married, and they have three granddaughters. Whenever possible he helps Rebecca with her home-based book resale business and is a board-certified professional pastoral counselor. In Father's words, "I speak in tongues". Join us all at CCR for our Day of Renewal and a truly inspirational day! Experience the Power of the HOLY SPIRIT! Mondays starting April 22, 2019 from 6:30 – 8:30 PM. Pastor Dan Richards will be the celebrant. by "The New Spirit Contemporary Group. The Mass is sponsored by "The Spirit of Love & Mercy Prayer Group from St. Rose and "Come & See Prayer Group from St. Patrick. Come ask the Lord for many blessings! Watch for news or call for next date! at St. Rose of Lima Church in York. Canned Vegetables, Corn, Peas, Green beans, etc. 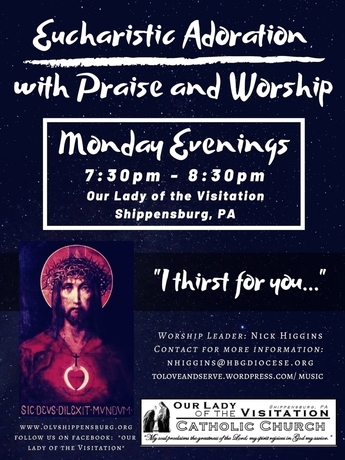 An evening of Eucharistic Adoration accompanied with Prayer, Meditation, and Praise & Worship Music is held on the first Wednesday of every month (except for Holy Days). St. Joan of Arc Church 359 W Areba Ave Hershey. A reception is held following the Caelorum in the cafeteria. All are welcome, please join us!